This Inflatable movie projection tent also called mobile cinema or protable theater. It's a blow up tent air structured bluiding. Our quality: Every product we shiped to client would be test before shipping. Will send video and photo to client for shipping confirmation. Customized service: Yes, please send us details and a sketch or a picture of your requirements and we will quote you our best price. We can manufacture the inflatable products according as your requirements, please send us your design, picture or sketch and inform us the size and the quantity of the customed products you want to order, we will quote you our best price. Blower: We can supply the air blower with the voltage of 110v, 220v, and 380v as your requirements. Shipping way: Shipment can be arranged by see or by air. The shipping cost should paid by buyer. Air shipping cost is much high but take short time for delivery, normally within 5-7days sea shipping cost is lower, it's much economical for large inflatable item, but take very long time for receive the goods, client need to do the import custom declaration by themselves. Normally sea shipping time is 15-30day or more, mainly depend on the vessel shipping line's shecdule. Package: We pack inflatable games by carpet at first, then put the package in tarpaulin bag so that the packages will not be frazzled during delivery process. In order to let you find your goods quickly, we will paste a mark paper with your order number. Instructions 1.3-10minutes to finish inflating; 2. Blower should be protected from rain all the time. 3. Repair kits are provided for repairing product. 4. After each use, fold product carefully and store it in proper place. 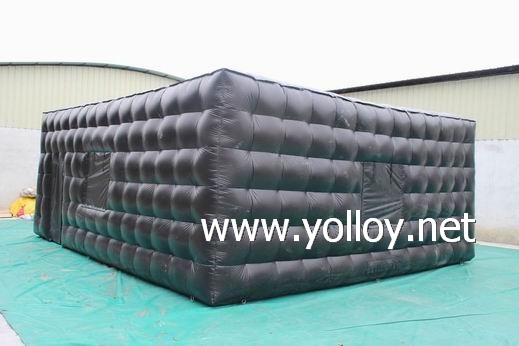 There are inflatable spider tent, inflatable marquee tent, inflatable dome tent, inflatable cube tent, inflatable tunnel tent, etc. It can be used in many party events such as promotion party, wedding party, dinner party, Or for disaster relief, family use to rest, entertainment and park car, etc. Most of all, it is portable, durable and convenient, you can use it whenever and wherever you need it !